Too much sand is being mined from San Francisco Bay. Without sufficient sand in the Bay, there's not enough to replenish shoreline areas, including places with severe erosion like Ocean Beach. In our lawsuit to stop excessive sand mining in the Bay, Baykeeper argued that the state must protect the Bay's sand on behalf of all Californians. And last month, the Court of Appeal agreed. The Court's ruling applies to state leases for any resource extraction, in any California waterway, requiring a higher standard to demonstrate extraction won't harm public resources. 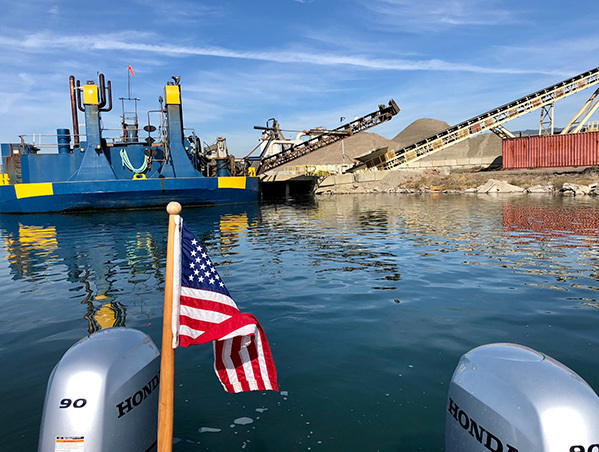 Unfortunately, the Court also found that there was not yet enough evidence of harm to Ocean Beach to require a reduction in the current levels of sand mining permitted in San Francisco Bay. And that means our fight to protect the Bay's sand is not over. 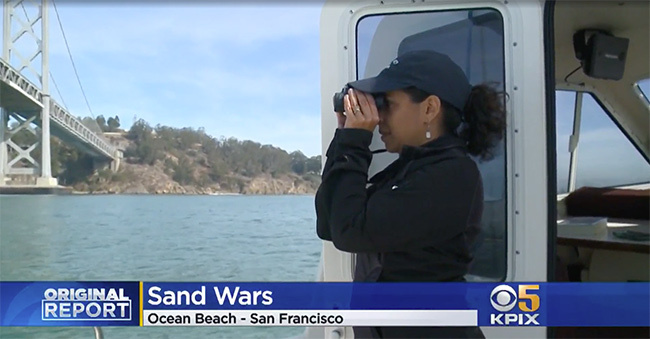 Watch KPIX's recent special coverage of sand mining in the Bay. There's not enough fresh water flowing into San Francisco Bay, because too much river water is being diverted to cities and southern California agribusiness. Without sufficient fresh water flowing through the Delta and Bay, pollutants accumulate, toxic algae spread, and fish die. Native fish like the Delta smelt and sturgeon are already at record low numbers. Last week, Baykeeper attorney Ben Eichenberg stood before water regulators and stated the threat plainly: "Without more water, the current ecological collapse we are witnessing in the Delta will only accelerate." Despite this risk, San Francisco's water utility has joined a coalition of Central Valley farmers, backed by the Trump Administration, to oppose decreased diversions with misinformation and biased research. And now state water regulators have postponed a vote on whether to increase flows to the Bay. This issue will be considered again later this year—and Baykeeper will be there, data in hand, to make the case for sustainable water use and healthy habitat. Read more about Bay-Delta water flows. The November 6 election yielded positive wins for San Francisco Bay. Thank you, Bay Area voters! 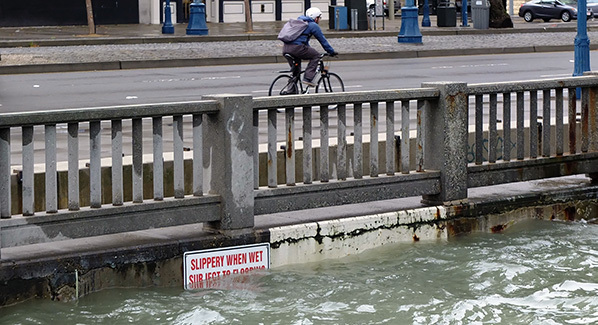 San Francisco voters passed Measure A, which will fund repairs for the crumbling Embarcadero seawall to mitigate the effects of sea level rise, earthquakes, and exposure. In San Jose, voters approved Measure T. Measure T includes funding for green infrastructure to stem the flow of sewage and trash into waterways. This measure was partly the result of Baykeeper's legal agreement with San Jose requiring the city to curb pollution of Guadalupe River, Coyote Creek, and San Francisco Bay. Over 1,000 sites contaminated with hazardous waste surround the Bay. Many of these sites already release pollution into the Bay—and sea level rise will amplify this risk. As waters rise, flooding will inundate toxic shoreline sites and allow pollutants to leach into the Bay. San Francisco's Hunters Point, which has been in the news lately and is contaminated with radioactive waste, is one particularly problematic example of a toxic hotspot vulnerable to sea level rise. Baykeeper recently identified the most vulnerable shoreline sites and created a map that's available on our ShoreView website, as well as a list of key recommendations that can be taken now to prepare for rising tides. When you think of the holidays, Bay contamination probably isn't the first thing that comes to mind. But every year, celebratory meals worsen sewage pollution in San Francisco Bay. That's because holiday cooking tends to generate a lot of fatty waste in the form of leftover cooking oils and greasy pans. When dumped down sink drains, these fats harden in the pipes running between homes and sewage facilities. Fat-plugged sewer lines are more likely to overflow and release sewage onto city streets and into the Bay. Make sure your deep-fried turkey, excess salad dressing, or oily scraps don't harm the Bay! Wipe down greasy pans with a paper towel and dispose of the towel in the compost or trash. For large quantities, pour oil into a sealed bottle and drop off at an oil recycling site. Read more about Bay-friendly kitchen cleanup. Giving Tuesday—the charitable antidote to Black Friday—is coming up on November 27. Giving Tuesday is a chance to give back to the causes you value most. And there are lots of ways to show your gratitude for San Francisco Bay. At Baykeeper this Giving Tuesday, we're seeking the Bay Area's support to expand our science team. By having a senior scientist on staff to manage our boat patrols and investigate polluters, we'll be able to increase our impact and protect the Bay from pollution even more. You can help us fund our new science position by setting up a personal fundraiser on Facebook for Baykeeper. Donations made on Facebook for Giving Tuesday will be matched, up to $7 million! Here are instructions for getting started. 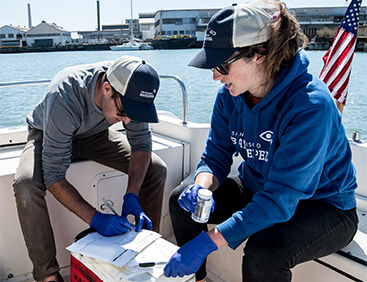 If you're ready to make your Giving Tuesday contribution to Baykeeper now to support our science team and help them investigate more Bay polluters, click here. The annual Sports Basement Baykeeper special is just in time for holiday gift shopping, November 25 to 28! All San Francisco Baykeeper Basementeers get a 20% discount in stores from the Sunday to Wednesday after Thanksgiving. And, as is true year-round, Sports Basement will donate 10% of Basementeer purchases and support Baykeeper's work defending the Bay. If you're not already a Basementeer, you can sign up at any time online or in-store by selecting San Francisco Baykeeper as your nonprofit beneficiary. You'll get 10% off year-round, and support Baykeeper with every purchase.